Deadly Animals: Ultimate Top Ten Meet the World's Most Dangerous Creatures by Ticktock. Review: Have you ever gone up to world's most deadly animals just to look at them? You can now because they are in a book! The book Deadly Animals Ultimate Top Tens by Tick Tock explains where they live and how deadly they are. In Deadly Animals readers will learn that scary animals can live in land, air and water. Surprisingly, even dinosaurs make the top ten list! This book is very educational. Within the book, they list animals that are deadly, but not deadly enough like they explain how they rank the animals based on shape, fierceness of attack, how lethal they are, and what they eat. For example the Poison Dart Frog, he earns 7/10 for lethal power. This book is so interesting, it has every single little detail that you would need for a paper on a very deadly animal. This book isn't just good for education; it's also good for reading for fun. This would be great for an audience 11 to 15 years of age. Deadly Animals Top Tens would be amazing to have on your own bookshelf. 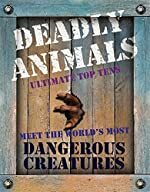 We would like to thank Ticktock for providing a copy of Deadly Animals: Ultimate Top Ten Meet the World's Most Dangerous Creatures for this review. Have you read Deadly Animals: Ultimate Top Ten Meet the World's Most Dangerous Creatures? How would you rate it?